Shela, it is Roger in Salt Lake City. It has been so long since I updated you as to this beautiful and fantastic dog Melvin. He was born December 12, 2007. You bred him perfectly. My wife, Camille, and I have enjoyed him by the second. He is our daily comedy. She walks him on the hillside estate and surrounding properties daily. We are very fortunate to be living and renting, while my new home on the mountains is being constructed–a three-year project. I have included pictures of the estate we are renting which is filled with an abundance of all types of birds. Camille was with me from the day I brought Melvin home. We are now married. She walks the dog 1-2 times daily. He reminds her of her walking duty if she ever forgets. He is so alert, it is scary. Nothing gets by him. One day I would love to consider an additional puppy. The tall blue features have always been our favorite. The key is his temperament. As much as I loved my first Weimaraner, which I bought in N. Salt Lake long before knowing about you, the temperament between Melvin and my old dog is night and day. Also, Melvin has had zero knee issues and almost no medical. Except, he got bloat from eating rocks at our daycare when we were out of town. They operated and sewed the lining in time. He has had no problems since. It has been three years. Other than that, he has had great medical success. We’re living in beautiful Southern Oregon now, and I’m still working as a vet tech. Addy is my big lap child, very spoiled and the sweetest dog I’ve ever known! She is my entire world!! Her favorite places are the beach pointing/chasing seagulls and in the woods sniffing out squirrels! As I mentioned on FB Addy will be a whooping 10 years old next month which is crazy to think, but thankfully she still runs & acts like she’s 3! She’s had an extremely healthy life so far which I’m very grateful for! I can’t believe Grandma Deli is 15+ and still running around! I’ve seen lots of Deli updates but didn’t see any Callie updates. How is momma Callie doing? Still with us, I hope! Pamela, it is so good for you to think of us. We could not select between these great photos that depict your life together. We are sure everyone will enjoy each photo you have sent along. As for Callie, she is alive and well. 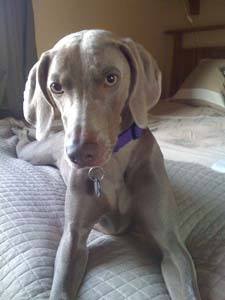 She is living with a family in Utah who have a Longhair Weimaraner. They are Weimlovers extraordinaire. Her life with them is one of constant doting and attention. They just adore her and allow for her to have the best of everything. She is much loved and spoiled. We look forward to working with you again Pamela! Note: Despite our attempts to avoid all problems, some occur. For any breeder to say they never have an issue (health or otherwise) should make you wonder. Sera had an undiscovered birth defect–a herniated diaphragm. It showed up during her first year of life. It is a very rare condition but when it occurs it can be of great concern. To clarify, we have never had one before or since. Nor do we know of any other breeder that had one. It is one of those things that can happen in rare situations. What it means for Sera is unclear. We will honor our guarantee as written. More than anything we are thrilled Sera continues to do well. Stephanie Reports: Sera is doing well. We have not really had any issues healthwise with her. She does not have a lot of stamina but she paces herself and takes a break on her own if she gets overexerted. We used to worry about having an emergency with her but she does her own thing and keeps going so we don’t worry anymore. You would never know by watching her activities that anything was wrong with her. She is very amusing and always looking for something to do. She is super easy to train and we take her with us on all our trips along with our other dog. She is great for road trips and is always ready to hop in the car with us. We enjoy her a great deal and all of our friends just love her personality. She can be quite stubborn – not sure if that is a breed thing or if she gets it from me – but she is fun! 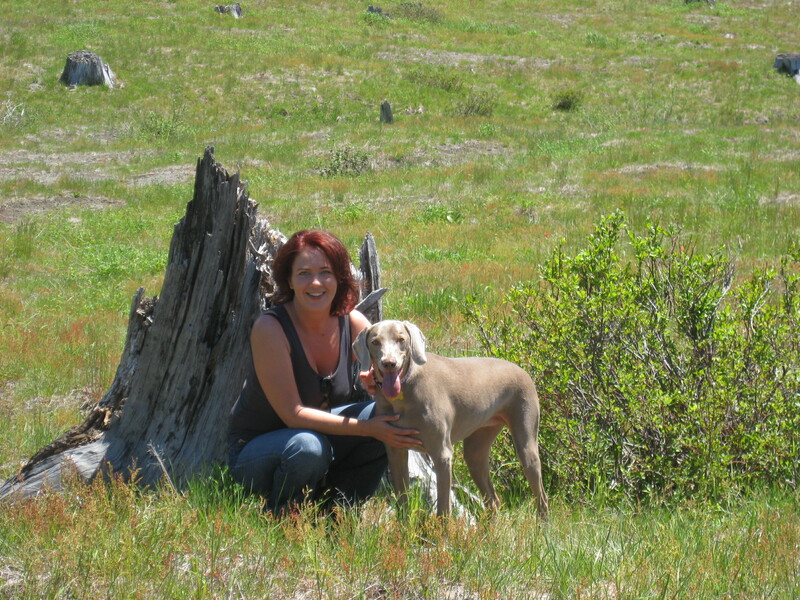 Above is a photo of her with me on a camping trip near Mount St. Helens this past summer. 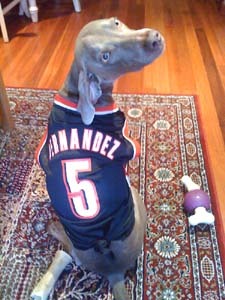 Perdy Decked out 4 the Game! Visit Perdy’s Web Page Too — Click Here! Terry Reports on Perdita’s progress March 18, 2010! My goodness, I cannot believe it has been so long since I updated you with Perdy’s progress, but she is doing great. We can hardly believe she’s going to be 4 this summer as she sometimes feels very much a puppy still. Perdita on Mom & Dad's Bed! Along the way she’s turned into a 50 lb lap dog that prefers couches and beds (where she tries to sneak under the covers) to the point that she’ll fall asleep standing up if her only option is a hardwood floor. It’s quite a funny sight. I’m attaching a couple of pics of her over the past year or so (from my phone, so I apologize from the poor resolution). Perdy got her own yard a month ago when we moved into a house. She’s enjoying the new place with frequent games of catch in the backyard and new neighbors to bark at. 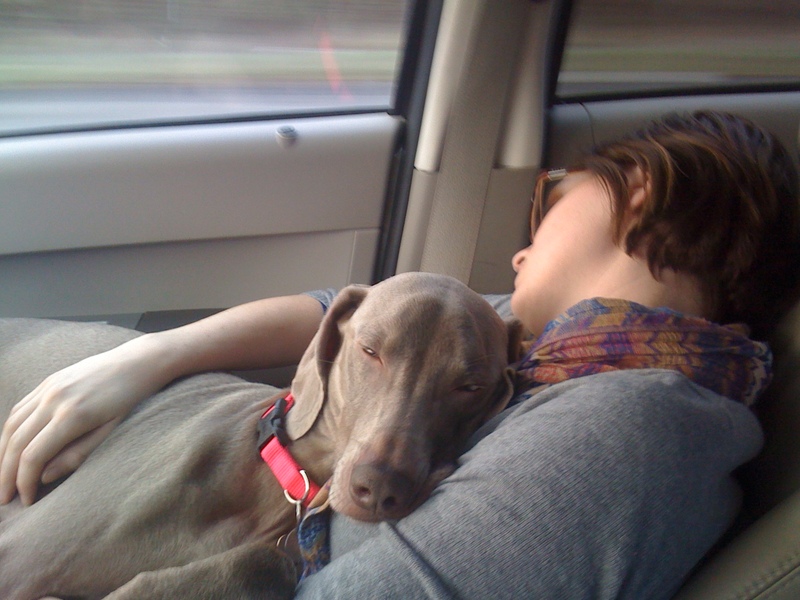 She tends to be on the over-protective side in general, though I believe that is quite normal for Weims. Breeder’s Note: For those reading this Terry is doing a very good job describing a true Weimaraner. They are very territorial and can be so to a fault. They prefer furniture and if they can be on your lap, in your bed, or beside you on the sofa they are the happiest. 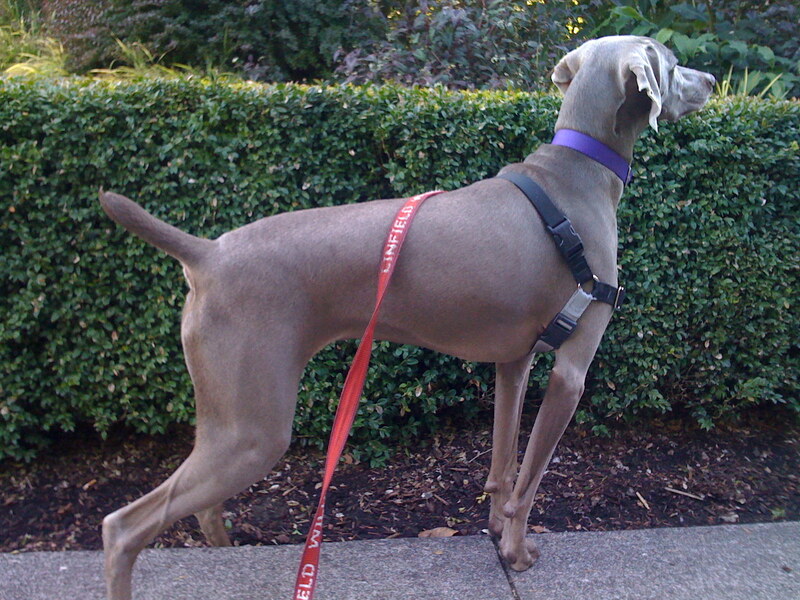 The ultra Velcro Weimaraner can learn limits but rarely thrives if too many limits are imposed. One thing for sure, they never totally grow up. If you are looking for a pup to get trained and shaped up look elsewhere. 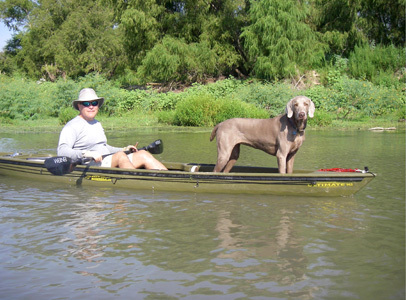 The Weimaraner is not right for you! For those of enamored with the breed perfection is overrated. In the new house she absolutely loves stalking the abundant birds either from the yard or through the windows when she’s inside. We’re a couple of blocks from a great off-leash park, which she has really enjoyed as well. We take her to Doggy Daycare at Dogstar in Portland when we don’t get up to the park enough to socialize. She loves it there and plays for hours with other bird dogs. I remember reading something you wrote a while ago about Weims being ‘Velcro’ dogs, and I couldn’t agree more. She’s happy to follow us from room to room all day, and hates being left home alone, which we generally avoid. She loves food and has been known to eat anything and everything. Last Halloween she even ate a pumpkin from the outside in like an apple. She’s an absolute joy and brings a lot of humor and love into our home. I couldn’t imagine life without her. Pumpkin season isn’t that far off…. Lacey is doing great! Always keeps us active. We even bought a 2nd kayak so she could go up river with us. She loves it! Thanks for all you do for us who have the blessing of your pups! We thank Cinda and David for sharing this picture….